Chess is a two-player strategy board game played on a chessboard, a checkered gameboard with 64 squares arranged in an eight-by-eight grid.Chess is played by millions of people worldwide, both amateurs and professionals. Chess is played on a square board of eight rows (called ranks and denoted with numbers 1 to 8) and eight columns (called files and denoted with letters a to h). The colors of the 64 squares alternate and are referred to as "light" and "dark" squares. The chessboard is placed with a light square at the right-hand end of the rank nearest to each player. By convention, the game pieces are divided into white and black sets, and the players are referred to as "White" and "Black" respectively. Each player begins the game with 16 pieces of the specified color, which consist of one king, one queen, two rooks, two bishops, two knights, and eight pawns. The pieces are set out as shown in the diagram and photo, with each queen on a square of its own color, the white queen on a light square and the black queen on a dark. Chess is believed to have originated in India, some time before the 7th century, being derived from the Indian game of chaturanga. Chaturanga is also the likely ancestor of the Eastern strategy games xiangqi, janggi and shogi. The pieces took on their current powers in Spain in the late 15th century; the rules were finally standardized in the 19th century. The first generally recognized World Chess Champion, Wilhelm Steinitz, claimed his title in 1886. Since 1948, the World Championship has been controlled by FIDE, the game's international governing body; the current World Champion is the Norwegian Magnus Carlsen. FIDE also organizes the Women's World Championship, the World Junior Championship, the World Senior Championship, the Blitz and Rapid World Championships and the Chess Olympiad, a popular competition among teams from different nations. 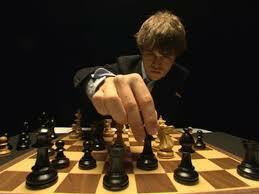 There is also a Correspondence Chess World Championship and a World Computer Chess Championship. Online chess has opened amateur and professional competition to a wide and varied group of players. There are also many chess variants, with different rules, different pieces, and different boards. FIDE awards titles to skilled players, the highest of which is grandmaster. Many national chess organizations also have a title system. However, these are not recognised by FIDE. The term "master" may refer to a formal title or may be used more loosely for any skilled player. Until recently, chess was a recognized sport of the International Olympic Committee;some national sporting bodies such as the Spanish Consejo Superior de Deportesalso recognize chess as a sport.Chess was included in the 2006 and 2010 Asian Games.